Designed to measure people's beliefs and behaviour with regard to money. 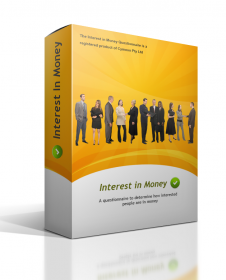 The Interest In Money Questionnaire has a variety of uses from general research to more specific applied uses. For example, one study recently conducted found that attitude to money was an excellent predictor of sales performance across a range of objective criteria. See the article here. The Interest In Money Questionnaire is designed by Professor Adrian Furnham from the Department of Psychology, University College London, United Kingdom.